The goal of this study was to compare facial profile attractiveness changes of patients treated with twin block appliance assessed by orthodontist and other dental specialist. Material and methods: The patient sample comprised 10 patients who undergo orthodontics treatment with Twin Block appliance. Triplets of facial profile photographs of the patients were randomly divided into two sets (before T0, after treatment T1). Two groups selected: 10 orthodontist and 10 dental specialists from different other branches (Excluding oral maxillofacial surgeons) in Rural Dental College were selected. Each judge independently ranked both sets of photographs using Visual Analog Scale (VAS) with an interval of 1 week between ratings. Result: On average, both orthodontists and other dental specialist found an improvement in facial profile attractiveness through Twin Block appliances treatment (VAS- T0-T1=1.4 +/-3.2 cm). However, the individual perception of attractiveness varied greatly in the twogroups. For time periods (T0- T1), lower VAS ratings were given by other specialist than by orthodontists. Conclusion: Other dental specialist rated facial profiles more critically than orthodontist. Twin block therapy in patients generally improves profile attractiveness, which is appreciated by all dentists. Over the last few decades, much has been published about the relationship between malocclusion and facial profile attractiveness. There seems to be general agreement that a straight (class I) profile is more attractive [1-7] than a convex class II or concave class III profiles [8,9,10]. However, there are certain gender differences, as slightly convex facial profiles are considered attractive in females, while straighter profiles are preferred in males [9,11,12,13]. Accordingly, one of the treatment goals in class therapy is to improve the facial profile. Common class II treatment approaches are, thus to advance the mandible with removable or fixed bite jumping appliances at proper growing age. Mandibular advancement using the Twin Block appliance has been shown to have a significant profile-straightening effect in adolescent class II patients. However, if growth is over as a less profound skeletal treatment effect is achieved during adult functional appliance therapy and, thus, profile straightening is less than that attained by a combined surgical orthognathic correction (BSSO) . This often discourages patients because of higher risks and costs associated with it. During the past 2 decades, orthodontists have responded to the concerns of their patients with facial esthetics. Given this increased focus on appearance, we orthodontists must understand as well as possible precisely how we perceive the “facial attractiveness” of our patients. Past orthodontics research in the area of facial attractiveness has focused on the evaluation of various manufactured models: e.g. .the study of profile silhouettes, computer-modified (morphed) images of the face, and commentaries on the faces of movie stars and beauty contest winners conventionally considered attractive, most studies focused almost exclusively on the profile views of the face [15-17]. Recent publications in the orthodontic literature have also included reports on differences in perceptions of facial attractiveness among various ethnic or age groups [18-20]. The designs and materials of this study were somewhat closer to clinical experience. Our focus was on the evaluation by orthodontists comparing with specialist of other branches i.e. Endodontist, Pedodontist, Periodontist, and Prosthodontist of dentistry. The reason to consider this group is because they are the one who mostly consulted by parents for their children’s treatment at private practices. And their opinion can really guide patients at proper age for more appropriate treatment. Oral maxillofacial surgeons were excluded from the other group to avoid bias, because they perform orthognathic surgery in adult to improve their facial profiles, so their perception will be somewhat close as that of orthodontists. In this article, we are more concerned with the agreement and disagreement among different specialist with the ranking of the individual’s triplets of photographs. (1) To what extent twin block therapy in growing age influences the facial attractiveness of orthodontic patients? (3) How do the rankings of experienced orthodontists compare with those of other specialist? The patient cohort contained 10 growing children with class II Div. 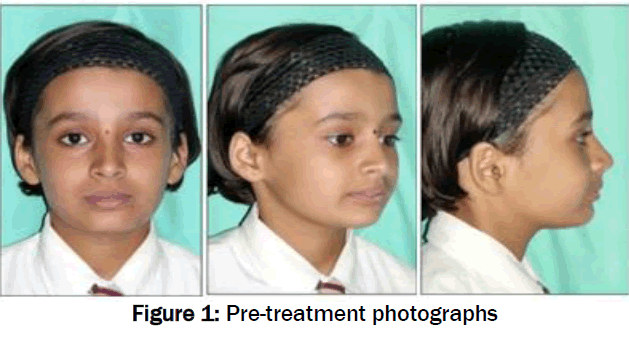 1 malocclusion (5 females, 5 males; 12 to 15 years of age) who had been treated with removable twin block appliances followed by fixed appliances at Department of Orthodontics, Pravara University of Medical Sciences and whom pre- and post treatment profile photographs were available. • No systemic complication, facial deformities. The judges were chosen from the clinical faculties at Pravara University of Medical Sciences of different dental departments (Dept. of Endodontic, Pedodontic, Periodontic, Prosthodontics) and Dept. of Orthodontics 10 on each group (5 male, 5 female). The clinicians who have minimum 10 years (35–58 years of age) of clinical practice experience were selected to avoid error due to age and knowledge. Triplets of photographs were made. i.e. profile, frontal and frontal smiling. These photographs of pre- and post-treatment divided in two sets randomly. The photographs were printed in full colour and of standard size (6′′ × 4′′). The evaluators were asked to look at each frontal or profile photograph and to score the overall facial attractiveness. The observers were completely blinded with respect to the treatment status (before/after). The observers were instructed to judge the attractiveness using a 10 cm Visual Analog Scale (VAS) with endpoints on the left by the descriptor “very unattractive” and on the right by “very attractive”. Both groups evaluated the two sets of photographs with a one –week interval between ratings to minimize recall bias and fatigue. 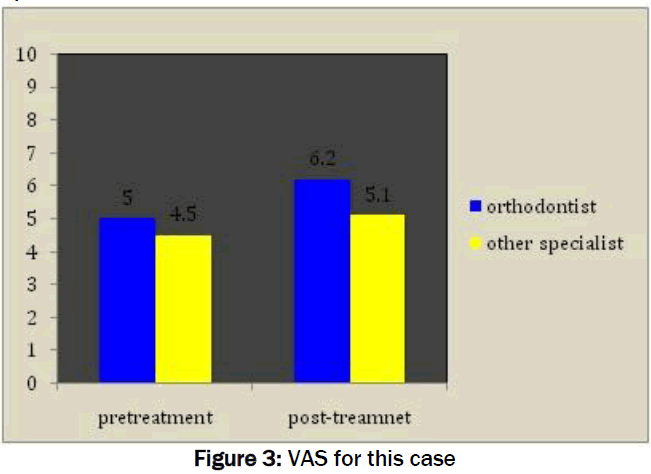 Before treatment, the patients were rated by both the orthodontists (VAS: 4.8 +/-2 cm) and the other specialist (VAS: 3.9 +/-2.1 cm), as having reasonably attractive facial profiles, although the other specialist gave significantly (p<0.001) lower VAS scores than the orthodontist (Figure 1). After treatment, slightly higher (P<0.001) VAS scores were achieved. Once again, orthodontist gave significantly (P<0.001) higher VAS scores (6.1+/-2) than the other specialist (4.6 +/-2.2) (Figure 2). The attractiveness ratings did not differ between genders of patients (P=0.768), as well as between gender of evaluators (P = 0.989), and there was no significant interaction between the gender of patients and the gender of evaluators (P = 0.813). The attractiveness ratings were not influenced by age of evaluators (P = 0.836). Overall, the amount of change in facial attractiveness of patients undergoing twin block appliance therapy for Class II skeletal malocclusion is consistent with slightly higher improvements. There have been several studies to determine whether professionals and the general public differ in their perceptions of facial attractiveness. Some authors have reported general agreement between clinicians and the public [4,21,22]. Other reports suggest that professionals and laypeople perceive facial aesthetics differently . Our findings indicated that the ratings of facial attractiveness vary among groups of evaluators with different clinical knowledge, and significant differences were found between the two groups. Considering orthodontists are taught to critically evaluate profile aesthetics, one would expect that the untrained eyes would be less critical . Even in Class I profiles, laypersons tended to give more critical aesthetic ratings of Class I profile than orthodontists . However, our finding conflicts with some of the existing literature. One study found other specialist tended to be more generous in evaluating profiles than orthodontists . When looking at average pre- and post- treatment changes in all patients, we noted a general tendency towards positive changes. In terms of individual patients, we observed a wide range of VAS values, which varied from person to person perception. The chin provides harmony and character to the face. A strong chin or prominent jaw line is considered to be aesthetically pleasing, especially in males [1-5]. Our study showed that there was a significant perceived improvement in the attractiveness of the chin after twin block therapy (Figure 3). Figure 3: VAS for this case. Attractiveness ratings were not influenced by the gender of the evaluators [3,5,25].However, our study found that there was no significant difference among female and male patients; therefore, this bias was of little consequence in our study. But the observer’s age also might play the role. Younger adults rated younger faces as more attractive than older faces, where as older rated all faces equally . Theobservers selected in this group were 35–58 years of age, so chance of bias is less. The use of the unmarked VAS proved to be a simple and rapid method for assessing the perceptions of facial attractiveness. VAS is more sensitive to small changes than simple descriptive ordinal scales. Additionally, ratings can be given quickly and the scores analysed as continuous measures. The difference between the pre-treatment and post-treatment mean scores indicates the direction of change as well as the extent of change (Phillips et al.) . In addition, the VAS can minimize biases towards preferred values as found with numeric or equal-appearing interval scales. Limitation of VAS, it is uncertain how many millimeters of difference in facial attractiveness are required to be clinically relevant and/or meaningful . In our study design, we preferred the use of photographs to profile silhouettes because we were assessing both the frontal and the profile attractiveness, as people tend to judge a person’s beauty by viewing them from the front. By using photographs, however, we were unable to eliminate all extrinsic and intrinsic distracting variables (such as hair style, make-up, and skin complexion) [27,28]. These variables could influence an evaluator’s aesthetic score rating. An unfortunate limitation in our method of analysis is that changes in features of the face occur with time due to growth. The average time between before and after photographs was 2 years. Over a period of 2 years, one would observe changes in facial shape and skin complexion. We have to accept that face attractiveness is influenced by multiple nonmetric factors that the facial profile only plays a minor role  and that beauty remains “in the eye of the beholder”. Finally, a potential problem of this study could be the relatively small sample size of evaluators and patients groups. Replication of this study at another institution to confirm our results and increase the total sample size should be encouraged. 2. However, the individual perception of facial attractiveness amongst two groups varied greatly, with other specialist to be much more critical than orthodontists in how they rated facial profiles. 3. These findings are consistent with the impression that, on average, the judgments of “facial attractiveness” by orthodontist and other specialist are much less different than had been expected for patients. Abu Arqoub SH, Al-Khateeb SN (2011) Perception of facial profile attractiveness of different anteroposterior and vertical proportions. Eur J Orthod 33: 103-111. Chan EK, Soh J, Petocz P et al (2008) Esthetic evaluation of Asian-Chinese profiles from a white perspective. Am J Orthod Dentofac Orthop 133: 532-538. De Smit A, Dermaut L (1984) Soft –tissue profile preference. Am J Orthod 86: 67-73. Kerr WJ, O’Donnell JM (1990)Panel perception of facial attractiveness. Br J Orthod 17: 299-304. Knight H, Keith O (2005) Ranking facial attractiveness. Eur J Orthod 27:340-348. Maple JR, Vig KW, Beck FM et al. (2005) A comparison of providers’ and consumers’ perceptions of facial –profile attractiveness. Am J Orthod Dentof Orthop 128: 690-696. Ng D, De Silva RK, Smit R et al. (2012) Facial attractiveness of skeletal class II patients before and after mandibular advancement surgery as perceived by people with different background. Eur J Orthod. Cox NH, Linden FP van der (1971) Facial harmony. Am J Orthod 60: 175-183. Czarnecki ST, Nanda RS, Currier GF (1993) Perceptions of a balanced facial profile. Am J Orthod Dentofacial Orthop 104: 180-187. Naini FB, Donaldson AN, Cobourne MT et al. (2012) Assessing the influence of mandibular prominence on perceived attractiveness in the orthognathic patients, clinician, and layperson. Eur J Orthod 34: 738-746. Foster EJ (1973) Profile preferences among diversified groups. Angle Orthod 43: 34-40. Macias Gago AB, Romero Maroto M, Crego A (2012) The perception of facial aesthetics in a young Spanish population. Eur J Orthod 34: 335-339. Shafee R, Korn EL, Pearson H et al. (2008) Evaluation of facial attractiveness from end-of treatment facial photographs. Am J Orthod Dentofac Orthop 133: 500-508. Chaiyongsirisem A, Rabie AB, Wong RW (2009) Stepwise advancement Herbst appliance versus mandibular sagittal split osteotomy-treatment effects and long-term stability of adult Class II patients. Angle Orthod 79: 1084-1094. Barrer JG, Ghafari J (1985) Silhouette profiles in the assessment of facial esthetics: a comparison of case treated with various orthodontic appliances. Am J Orthod 87: 385-91. Hier LA, Evans CA, BaGole EA (1999) Comparison of preferences in lip position using computer animated imaging. Angle Orthod 69: 231-238. Maganzini AL, Tseng JY, Epstein JZ (2000) Perception of facial esthetic by native Chines participants by using manipulated digital imagery techniques. Angle Orthod 70: 393-409. Soh J, Chew MT, Wong HB (2005) A comparative assessment of the perception of Chinese facial profile esthetics. An J Orthod Dentofac Orthop 127: 692-699. Phillips C, Griffin T, Bennett E (1995) Perception of facial attractiveness by patients, peers, and professionals. Internat J Adult Orthod and Orthogn Surgery 10: 127-135. Romani K L, Agahi F, Nanda R, Zernik J H (1993) Evaluation of horizontal and vertical differences in facial profiles by orthodontists and lay people. Angle Orthodontist 63: 175–182. Shelly A D et al. (2000) Evaluation of profile esthetic change with mandibular advancement surgery. Am J Orthod Dentofacial Orthop 117: 630–637. Cochrane SM, Cunningham SJ, Hunt Np (1999) A comparison of the perception of facial profile by the general public and 3 groups of clinicians. Int J Adult Orthod Orthognath Surg 14: 291-295. Spyropoulos MN, Halazonetis DJ (2001) Significance of the soft tissue profiles on facial esthetic. Am J Orthod Dentof Orthop 119: 464-471. Orsini MG, Huang GJ, Kiyak HA et al (2006) Method to evaluate profile preferences for the anteroposterior position of the mandible. Am J Orthod Dentof Orthop 130:283-291. Foos PW, Clark MC (2011) Adult age and gender differences in perception of facial attractiveness: beauty is in the eye of the older beholder. J Gent Psychol 172: 162-175. Al Yami EA, Kuijpers-Jagtman AM, Van’t Hof MA (1995) Assessment of dental and facial esthetics in adolescents. Eur J Orthod 20: 399-405. Matoula S, Pancherz H (2006) Skeletofacial morphology of attractive and nonattractive faces. Angle Orthod 76: 204-210. Honekopp J (2006) Once more: is beauty in the eye of the beholder? Relative contributions of private and shared taste to judgments of facial attractiveness. J Exp Psychol Hun Percept Perform 32: 199-209. Sloss EA, Southard KA, QIan F et al (2008) comparison of soft tissue profiles after treatment with headgear or Herbst appliance. Am J Orthod Dentofac Orthop 133: 509-514.